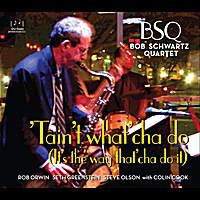 BSQ does nothing ordinary -- It brings fresh approaches to great songs that have been overlooked or forgotten, and to originals that explore the roots of swing. This album also features a young guitarist, Colin Cook, of which much more will be heard. "BSQ is a rewarding band because they give a lot of thought to the choice and presentation of their material; because they know, love, and respect the roots of jazz and the importance of swing; because they're all creative and well-schooled players; and because they so obviously enjoy playing music with each other. 'Tis what it's all about."